Canon recently lent me one of their pre-production models for the 7D Mark 2. Heard so much rave reviews from other sources online, so getting to hold one was quite a treat. I was happy to oblige doing a review and then some. Off the bat, the 7D Mark 2 looks alot like the 5D Mark 3 in terms of size, weight and ergonomics. The control panel is virtually the same save for the thumb switch found on the side of the thumb stick. This nifty addition makes a huge leap in how the camera is used. The 7D Mark 2 AF system was built from the ground up. Packed with the Dual AF and Phase Detection features, the camera focus was such a joy to work with. It was fast and incredibly accurate. Now most people tend to measure a camera’s capabilities mainly through the resolution / megapixel count, which is a common misnomer. An overlooked factor is pixel-pitch. This is accounts for the amount of information each sensor can handle. The bigger the pixel pitch, the more information it can store (hence, smoother gradations in color). This is where full-frame cameras have an advantage: a full frame means bigger pixel pitch sensors relative to the sensor size. But after my experience with the 7D Mark 2, it left me scratching my head. The innate disadvantage in the sensor / pixel pitch department is made up by having two (2) Digic 6+ processors, which I think goes beyond compensating. In my natural light shoots, I intentionally overexpose in the settings to work around with back-lit subjects. This has been my habit for the past bodies I’ve held (5D, 1Ds-Mark 3, 5D Mark 3…), but pleasantly surprising though, a 7D Mark 2’s metering system is accurate. I had to consciously unlearn over exposing the shot from using my 5D Mark 3. I sort of swore to myself never to go back to cropped-sensor cameras after holding the 5D (and it’s eventual successors), but this camera just gave me 2nd thoughts. My lighting setup for Bianca’s shoot. But then, there’s no use talking about how the camera just by the looks without trying it out on an actual shoot, so I called up one of my favorite modelesque friends, Bianca, for an afternoon session in the studio. I was thinking of making this entry two-fold, so this is also going to be a lighting tutorial on doing a basic pin-up shot. This is one style that’s been a classic favorite of mine next to cosplay. My personal workflow in doing pin-up involves using a semi-harsh main light (e.g. beauty dish), and balancing out soft and harsh highlights behind the model’s flanks. 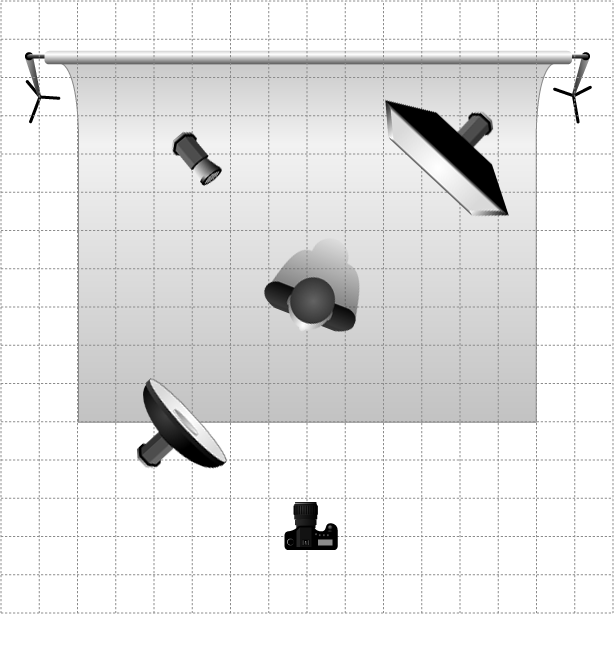 The base formation is actually a variant of the short light setup. Instead of lighting up the short side of the model, my guide would be there the nose is pointing. That’s where I flank my main light. For this shoot, the light was on the camera left. On its opposite side would be the softer highlight, while the harsher highlight is on short side of the model as a highlight. There’s an optional fill light underneath the beauty dish just in case (as you could see in my actual lighting setup), but this is the basic using a three (3) light setup. The power of the fill is adjusted according to preference. Mine is about 1.5 stops weaker than the main. But as a parting note: lighting can only take you so much, but the rest of the look brought home through make-up and styling. Bea is a host of an online TV show called Upload. She had the entire shoot featured in an episode with some of the stupid stuff I am willing to do on-air. You could check it out here. Also, you could read more of my review in the 7D Mark 2 in this month’s issue of Speed Magazine. For complete specifications on the 7D Mark 2, there’s always DPReview to make the comprehensive lowdown on it. Check out my youtube channel for your regular glimpse behind the scenes! While you’re at it, drop buy the online store and get goodies from your favorite models!